Heuchera glabra Willd. ex Roem. & Schult. 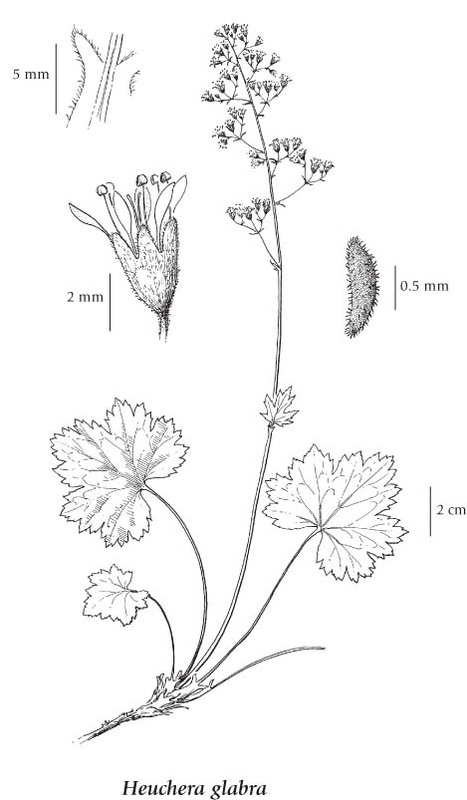 Perennial herb from well-developed, horizontal to ascending rhizomes, clothed with old, brown leaf-bases and stipules; stems 1 to several, erect, 15-60 cm tall, smooth to finely glandular-hairy below, strongly glandular-hairy in the inflorescence. Basal leaves heart-egg-shaped, 3-9 (14) cm wide, shorter than wide, palmately 5-lobed 1/3 to 1/2 to base, the lobes shallowly lobed and coarsely toothed, sparsely glandular-hairy below, smooth above, the stalks long; stem leaves 1 or 2, greatly reduced, the upper bract-like; stipules membranous, fused to the leaf stalks. Inflorescence an open, many-flowered cluster, the branches and flower-stalks thread-like, the bracts linear; petals white, 5, 2- to 4-times longer than sepals, clawed, the claws slender, blades diamond- to spoon-shaped; calyces greenish-yellow, cone-shaped, glandular-hairy, joined to ovary almost to top, the free hypanthium less than 0.5 mm long; calyx lobes 5, oblong-egg-shaped, about 2/3 length of lower portion; stamens 5, longer than calyx lobes. Capsules, 5-6 mm long, egg-shaped, opening along the beaks; seeds brown, 0.7-0.8 mm long, with lengthwise rows of about 20 spines. Moist rock crevices, rocky meadows, streambanks and talus slopes from the montane to alpine zones; frequent in S BC, infrequent northwards and absent in NE BC; N to AK, E to SW AB and S to N OR.